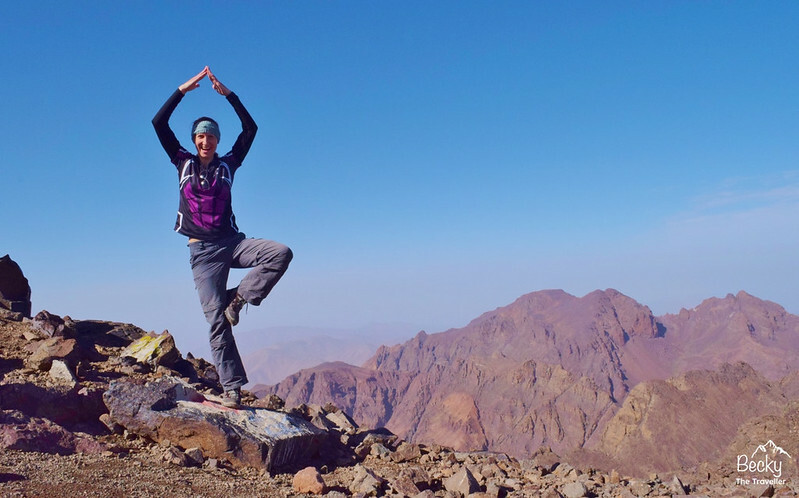 Mount Toubkal in Morocco’s Atlas Mountains is certainly a hike not to be taken lightly. At 4,167 m/13,671 ft the high altitude makes this a challenging adventure. Not only is Mount Toubkal the highest mountain in Morocco but it is also the highest mountain in North Africa. But I love a challenge and trekking in the Atlas Mountains was a great adventure. 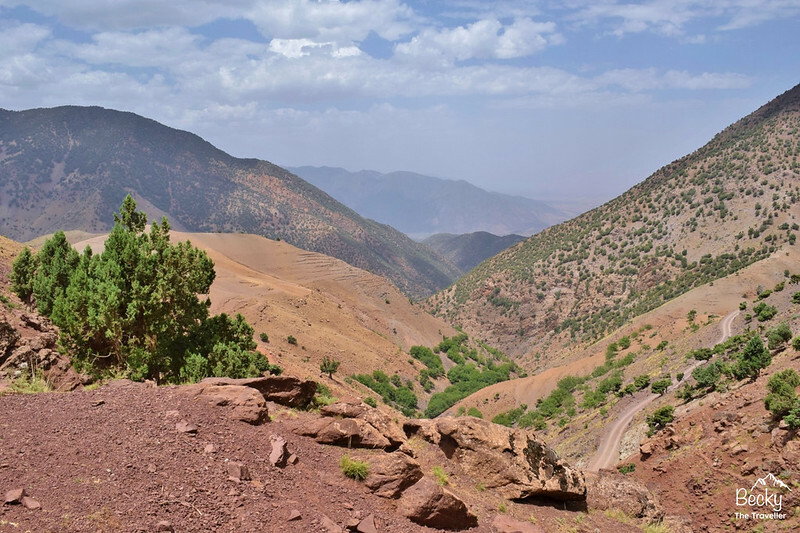 Situated in Toubkal National Park and a short drive from Marrakech, trekking is a great way to explore the beautiful Atlas Mountains and local Berber villages. 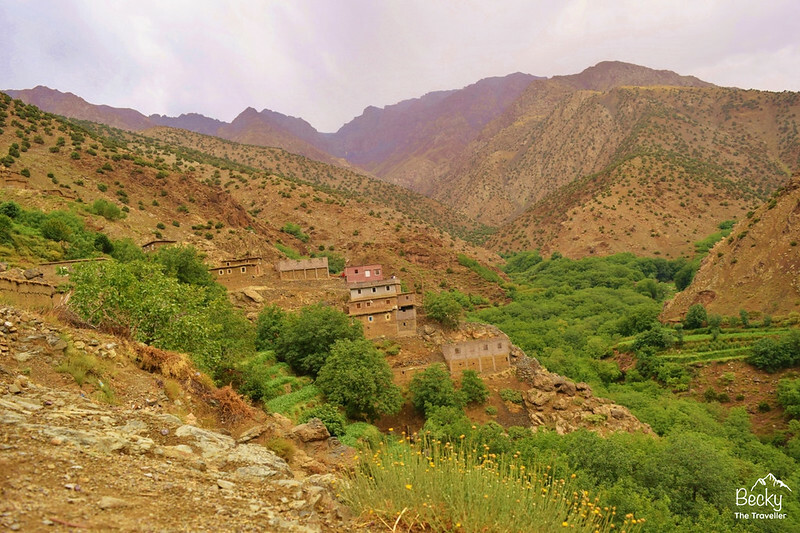 Many people opt for a one day trip to the Atlas mountains but I chose a 4-day hike with a group tour via GAdventures. Their tours trekking the Atlas Mountains take place between May and October each year. The trek doesn’t need any technical ability, just a good level of fitness. It is also a great hike for your first high altitude challenge as it’s not too high but useful to see how your body copes. Ideal, if you’re thinking of doing a bigger trek, such as Mount Kilimanjaro in Tanzania or the Annapurna Circuit in Nepal. Here’s my experience trekking the Atlas Mountains in Morocco. Leaving Marrakech we jump on a minibus. I distinctly remember it was a twisty journey as my travel sickness creeps up on me. Never a good start to a mountain hike! After an hour and 40 minutes, we arrive at the start point in the Atlas Mountains Imi Oughlad. I booked my hike in the gorgeous summer month of July. Thinking that it wouldn’t be as cold at the top of the mountain. But this leads to another issue. Starting a hike uphill in the Atlas Mountains at 40 degrees plus temperature is pretty tough. Especially considering I had felt sick from the bus journey! Thank goodness for the walnut trees, we can stop under for some shade and drink water. I think we have only been walking for 30 minutes. Wow, this heat really makes it tough. Alongside the path, there are small shrubs and thistles growing but luckily the track is well-trodden so makes things easy for trekking. 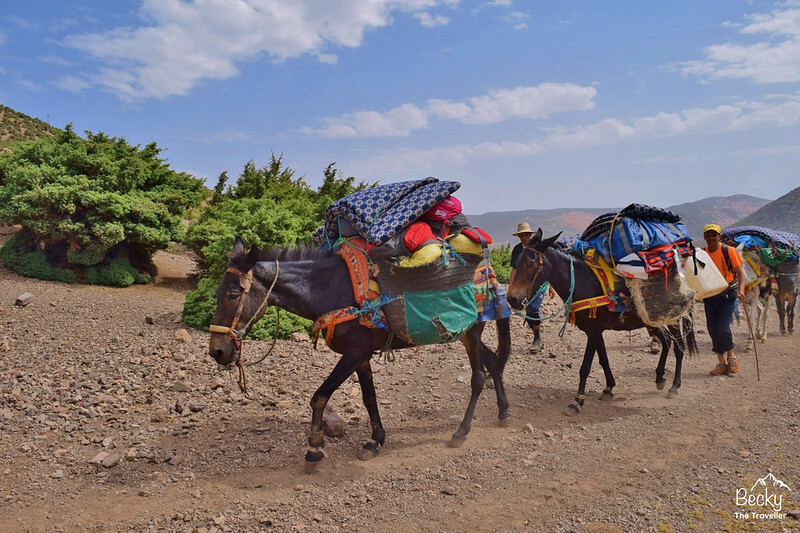 As you trek in the Atlas Mountains you’ll meet several characters on the way up. Huge herds of goats bleat and give you added support on the hike. Honestly, some of them sound so real, it’s very amusing and takes your mind off trekking. The first herd of goats had some seriously over-protective dogs with them. Really snarling at us as we walked by, I guess just doing their job. Deep breaths and keep walking. Phew, I made it! Most of the hard trekking is done by lunchtime. Our reward is an amazing Moroccan salad, with pasta and sauce prepared by our team. We have plenty of time relaxing under yet another walnut tree. I am beginning to like walnut trees! Arriving at our gite is a fantastic feeling, it’s basic but there’s a hot shower and the food is amazing. Which is all you want after a day’s hike. Shortly after we arrived there was a crazy downpour, wow good timing! But a few hours later the sky clears and darkness creeps in. One of my favourite things about being in the mountains is being away from light pollution. The sky looks amazing, there are so many stars. And more you stare up the more stars you see. So we all dragged our mattresses outside and spent the night under the stars. With the rule if anyone woke up and felt rain they had to wake everyone else up too! Drink lots and lots of water, you don’t want to get dehydrated before you have even done day one. And secondly, don’t get too close to the goats, you never know who is watching you! And a special sleeping bag tip, dedicated to one of our group. When buying a sleeping bag, check it is for adults, not children!!! It’s a beautiful day, lovely and warm. Not quite as hot as Day 1! The hike today starts straight uphill, which is always a great way to wake yourself up. Now one of my favourite stops. Fresh orange juice seems to be available everywhere in the Atlas Mountains. One of the guys from the gite has set up a little orange juice stall and it’s freshly squeezed right in front of us. Out mules stop for a break too and they are treated to the leftover oranges which is lovely to see. After the amazing orange juice break, we then have the steepest path to climb. It’s a switchback path, perfect because you can’t see how far you have to go! And more importantly, lots of mini breaks to breath and drink more water. Lunch stop is 4 hours into the hike, at a dizzy height of 2,930m/9,613ft. The high altitude is making the air is so much thinner than before. There’s a great chance to chill and enjoy the view. More importantly, you can see where you are going next and it’s all downhill. It’s a good hour break for lunch again which is fantastic, chance to recharge your energy and catch your breath. Starting the trek again after lunch you can see in the distance the village Armed where we were staying. This is back to a normal height 1,900 m/6,234 ft. And is all part of helping you to acclimatise for the big climb ahead. Arriving at about 4 pm, it’s the normal queue for the shower, then you have time to explore the local Berber village in the Atlas Mountains. There is also a walk right to the top of the village with a 360 degrees view. Dinner at the gite tonight is another amazing Moroccan stew with beef and loads of vegetables. I can really get used to this food, it’s so lovely and perfect hiking food. Have a good breakfast and drink lots of water too. An early wake-up call today as the 5 am call to prayer wakes me up! We leave the gite around 8.30am and make a slow steady hike out of the village. Shortly into the trek on day three, you can see Mount Toubkal, the highest peak in the Atlas Mountains. We have another orange juice stop. There are only 5 glasses so it’s a drink up, quick wash so everyone can have a glass. It is like some super juice, gives you just enough energy to keep going! This part of the trek is a lot busier, we walk at a lot slower pace and regularly have to stop to let mules pass. You really don’t want to get in their way. But that’s great, just an opportunity to take more photos. Arriving at Mount Toubkal base camp just before 1 pm, it’s such an amazing sight. The mountain weather is starting to creep in, thunder is rumbling away and very soon the rain comes. It’s a mad dash to quickly put all the tents up before everyone gets wet! When it rains in Morocco’s Atlas Mountains it really rains. We all hang out in the big tent until it stops. I am so glad we are not out hiking. Then its chance to adjust our tents we hurried to put up. The ground is hard difficult to put tent pegs in but there are plenty of big boulders you can use to secure it. Basecamp is a well established and pretty busy place. There are a lot of people preparing for the early morning hike the next day. This is where the mules hang out to rest too. The main block has proper toilets and showers. Plus a tuck shop so chance to treat yourself! Dinner is an amazing banquet, laid out for us in the tent. The food just keeps coming and it’s amazing. We have a tough hike ahead so it’s a good excuse to eat lots! Bedtime doesn’t come soon enough at 10 pm, ready for the early start the next day. Make sure your tent is well put up otherwise a big downpour might cause a few leaks! A pack of cards is a great way to pass the time in the rain. I love my Thermarest mattress – lightweight and ensures a good night’s sleep. Seriously, the ground is just rock so this really is a must! Our guide shines a torch in our tents to wake us up around 5.30am. It’s still dark outside. Breakfast is porridge with cinnamon, it’s difficult to eat so early in the morning but I know I need the energy to get me to the top. Finally, we are all ready to leave at 6.30am. The path starts steep straight away so it’s slow and steady, trying to keep my breathing as normal as possible! Our guide is fantastic, “we are nearly halfway” he tells us, that’s good for keeping us motivated. Then 40 minutes later “we are nearly halfway”, hmm something strange is going on! I have no idea where half way was but the important thing is to keep walking and making progress. The path starts to get rocky so you need to pay attention to where to put your feet. There’s no way I want to twist my ankle. Now the path changes again. The next section trekking is great fun, huge boulders so a mini challenge. The best way is to scramble and use your hands to help steady you. Much better than falling over! Keep focused and slowly trekking further to our summit. There’s a scree section next, I love how there are so many mini challenges on the hike up. Our guide groups us all together at a great viewing spot. Chance for some nuts and photos before the final push to the summit. So apparently, we have another 15 minutes to go from here, haha well I am not sure if I believed my guide or not! But yes he’s right, another 15 minutes and there I was standing at the top of Mount Toubkal in the Atlas Mountains. Wow, what a feeling! There are 360-degree views and it’s a spectacular sight. So we have done the hard uphill, the fun part is now to come. The scree path that we struggled to climb an hour earlier now becomes a huge slide. I absolutely love the downhill, I used to cautiously make my way down but now I do a half run/slide kind of thing. For me, this has less impact on my knees but do whatever you are comfortable with. I don’t want to get in trouble for telling you to run down a mountain haha! We all make our way back down to base camp and arrive between 12-1pm. There is an amazing lunch laid out for us and I am so hungry! There’s plenty of time to rest before we set off on our final hike back to Armed. The path is the same route we walked up just a day before so we know exactly how far it is to go. Finally, the little village is in sight and we arrive back at 5.30pm. Tired but happy. What a great feeling and such a massive achievement. Our Atlas Mountain challenge is complete, we have all conquered the mighty Mount Toubkal. Time for another Moroccan experience now, the Moroccan Hamman a traditional spa. Loss of appetite is a common side effect of high altitude but you really need to start with a good breakfast and lots of snack on the route too. 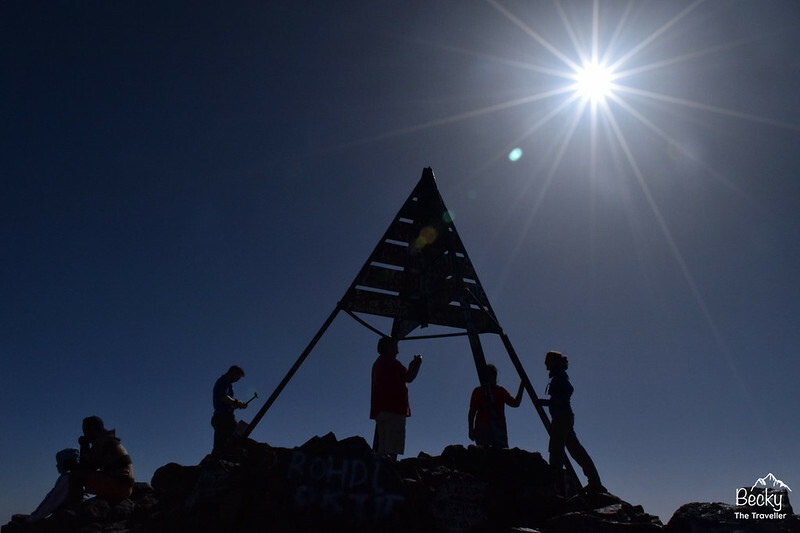 Worried about the high altitude whilst trekking Mount Toubkal? Read my full guide here on tips for preventing altitude sickness. Are you ready for trekking in the Atlas Mountains? 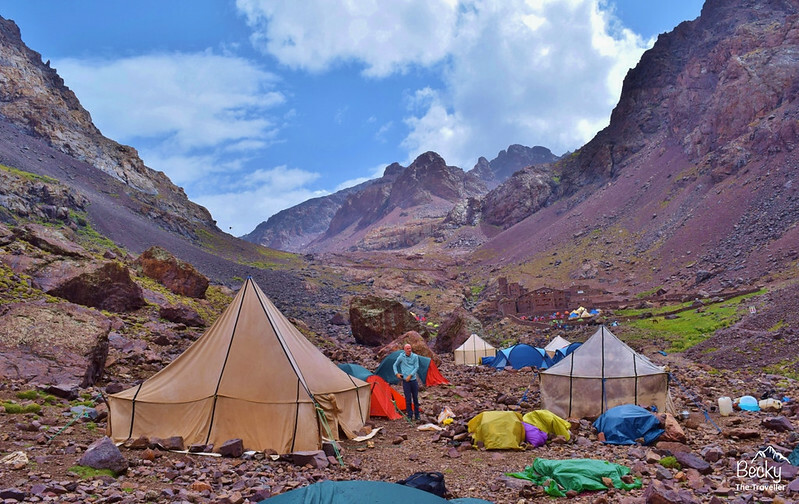 Are you worried about the Mount Toubkal high altitude? Ask me any questions in the comments below. Sign up now for my monthly newsletters to receive all my latest posts, top travel and hiking tips. Plus competitions, giveaways and discounts so you can travel more! My Top 10 UK Hikes From 2018 – Why Last Year Was Epic! Love it! Hiking is one of my favorite activities. I would definitely consider doing this hike when I visit Marocco. It looks very beautiful from the pictures. Can imagine what is it like in the reality. Can you shared how much cost the tour? Hi Biylyana, ah that’s great to hear, do you have any idea when you are going yet? Yes of course the tour was around £400, this includes accommodation back in Marrakech before and after the trip too, so 6 nights accommodation. Plus some meals – 6 breakfast, 4 lunch and 4 dinners. Hope that helps. Let me know if you need to know anything else. Wow, this looks like quite an adventure! I’ve been traveling pretty regularly for about two years, and I haven’t really dipped my toe into the world of big hikes and mountain climbing. I’d love to do a major mountain someday! Thanks very much, so kind Kelly. Honestly I think that most people could do this hike with a little bit of training, it’s not a walk in the park but high altitude means you walk at a much slower pace. Well I will continue to see if I can persuade you. This is exactly the kind of trip I love – and I’ve been dying to go to Morocco! I am impressed! I did a one day hike and about died but it truly was a spectacular view and the people were so kind. This post brought up some great memories for me. Also good tips about the walking boots, the terrain is a little bit hard for the normal sneaker. I love the Atlas Mountains, but we didn’t do much trekking on our last visit. Now I want to go back! Ha ha I know that feeling, there’s always something that I didn’t do when I visited somewhere and want to go back!! But the views are gorgeous and I can absolutely see why you did it! What a wonderful experience! Although, I feel bad for the sweet mules. Did they seem to have trouble carrying all that weight? The mules are pretty strong and we were limited to the amount of weight in our bags so only essential items came along. I think it looks worse because the have the mattresses drapped over but they were quite light. The mules did have lots of breaks too and the bags were taken off to give them a proper rest. What an adventure! Looks like a grueling but scenic hike. I really regret not going hiking in the Atlas Mountains when I was in Morocco. They are so beautiful! But we did get to drive through them. Hopefully I’ll be able to hike there next time. Yes I agree, at least you did get to see a bit of them with the drive. I remember seeing a road we crossed on day one and thinking it just took us 4 hours to walk this and we could have done it in a car ha ha! 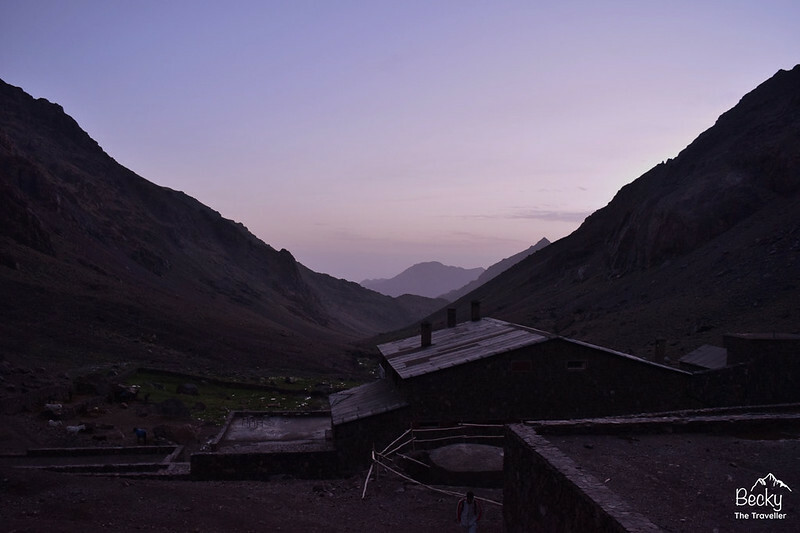 Absolutely love this post about the Atlas Mountains. I saw your picture with the tent in the middle of the mountains a few days ago on Instagram! I ve been to the Atlas mountains on a 1 day 4wheel drive tour, but this looks even more adventurous! That is quite the epic trek up a mountain. The trek looks challenging as is without the heat to start with. Great tips for people looking to follow in your footsteps. Maybe one day we will work up to this. Yeah I honestly thought what had I got myself into when we started on day one, it was crazy hot but soon worked out well as I think a few hours heat at the bottom meant a much warmer night. Wow, looks like a beautiful trek! Its crazy I have never read about it before! Thanks Megan, yes it was a lovely trek. I don’t think it is that popular but actually quite a good thing as means you have the path to yourself most of the time! I’m headed to Morocco next month, so you better believe I’m bookmarking this. Thanks! Ah fantastic, would love to know how you get on. Whereabouts in Morocco are you heading? Oooo, Morocco is actually one of my next travel destinations, so this is super helpful! Thanks – pinning for reference! Wow! Loved your trekking experience. Now I too wanna do it. Thanks for sharing. Ah thanks Archana, glad I have inspired you. So get booking :). Feel free to give me a shout if you need any more tips. The area looks quite dry but must be an adventurous hiking experience! Morocco is on my bucket list. Hope to visit there soon! Yes the area was pretty dry but when the rain came thundering through the mountains you defintely knew about it. Although it doesn’t tend to last that long but make sure you pack a rain jacket! I am getting super interested in highpointing. Some mountains are way out my skill set (eg. Mt Cook in NZ), but this looks doable! Very cool.